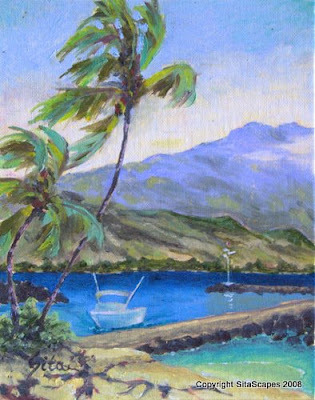 Artists Comments: There were several visual lines that attracted me to paint this subject: the sandbank, pier, distant edge of the water where it meets with the land, hillside slope, Hualalai mountain and cloud bank. This combination of horizontal lines were set in contrast to two tall palm trees swaying in the strong breeze. After sketching my painting and laying in major washes of color a small white boat returned from a day of fishing on the sea. I couldn't resist placing it into my painting despite my preference to not paint man-made objects in my work. I believe it adds a nice focus and scale to the painting.